With an experienced sales team, we have the knowledge and expertise to help you grow your business. 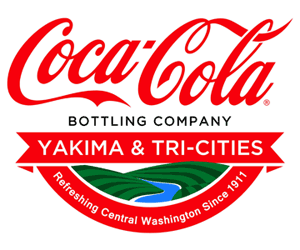 Coca-Cola Bottling of Yakima & Tri Cities is proud to distribute the world’s most dominant and thirst-quenching beverages for all occasions. We offer more than 500 beverages throughout the South Central and South Eastern part of Washington State, with everything from soft drinks to sports drinks to organic teas and premium juices. The Coca-Cola Company is continually evolving product offerings to reflect peoples’ changing tastes and needs. WE offer a large selection of reduced, low and no-calorie drinks such as Coca-Cola Life, Diet Coke, Coca-Cola Zero Sugar, Sprite Zero, PowerAde Zero and VitaminWater Zero. With trucks on the road Monday-Friday, we can offer various delivery solutions depending on your volume and location. We offer a variety of coolers to keep your Coca-Cola products ice cold, fountain units, ice machines, and vending equipment. From quaint diners to large grocery stores, we have a solution for every customer. Our highly trained local technicians are available for service 24/7. From Vending machines to Ice Machines to Coolers, we have a service technician for the job. If you need equipment service, please fill out our service request. If you are interested in becoming a new customer of Coca-Cola Bottling Company of Yakima & Tri-Cities, please complete the Contact Us form and a sales representative will contact you.